(Nanowerk News) Unlike the windows of your house, nanoscale holes in graphene (named as "nanowindows") can selectively choose which type of air molecules can pass through. Scientists from Shinshu University and PSL University, France, theoretically proved concerted motion of the nanowindow-rim to selectively allow molecules to pass, in an energy-efficiently and fast way (Nature Communications, "Air separation with graphene mediated by nanowindow-rim concerted motion"). This brings up new possibilities to create an advanced molecular separation membrane technology. 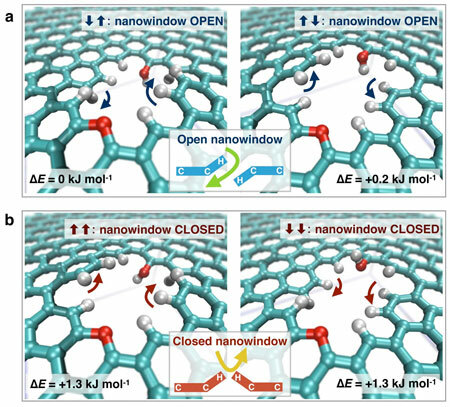 The mechanism of separation by nanowindows is that the atomic vibration of the nanowindow-rim changes the effective nanowidow size. When the rim of one side is deviated and the other is deviated to the opposite direction, the effective nanowindow size becomes larger than when the rim does not move. This effect is very predominant for molecules of oxygen, nitrogen, and argon, inducing an efficient separation of oxygen from air. The study considered separation of the main components of air: oxygen, nitrogen and argon. They have high industrial needs; innovative air separation technology has been highly demanded. The molecular sizes of oxygen, nitrogen, and argon are 0.299, 0.305, and 0.363 nanometers (nm). The researchers compare the permeation of these molecules on 6 differently-sized nanowindows (of 0.257 nm, 0.273 nm, 0.297 nm, 0.330 nm, 0.370 nm, and 0.378 nm). Nanowindows were prepared by oxidation treatment. Thus their rims are passivated with hydrogen and oxygen atoms, which have essential role for selective permeation. Surprisingly, the molecules permeate through nanowindows even when the rigid nanowindow size is smaller than the target molecular size. For example, O2 permeates faster through 0.29nm nanowindows than 0.33nm nanowindows. The difference in permeation rate is associated with the interaction of the molecule with the nanowidow rim and graphene. The mechanism is explained using interaction energy and vibrational motion of the oxygen and hydrogen at the nanowindow rim. In the nanoscale, the local electric filed coming from the nanowindow rim having hydrogen and oxygen atoms is large enough to determine the orientation of oxygen and nitrogen molecules, giving a highly selective permeation through nanowindows smaller than oxygen molecules. This selectivity sensitively depends on the structure and property of a gas molecule and the geometry (size and shape) and rim-chemistry of nanowindows. The concerted orientational motions of the hydrogen and oxygen atoms at the nanowindow rim caused by thermal vibrations change the effective size of the window approximately 0.01 nm. The concerted vibration at the nanowindow rim can open the nanowindow for preferable molecules (oxygen gas in this case). This study evaluated mixed gas permeation to measure selectivities. Separation efficiencies exceeded 50 and 1500 for O2/N2 and O2/Ar at room temperature, respectively. The current membranes have obtained permeation rate selectivities 6 for O2/N2 but at the same time they lack high permeation rate. This shows promising possibility of the dynamic nanowindows in the graphene. Air separation in current industry uses distillation, which consumes large amount of energy. Gases used in this study are widely employed in various industries such as medical, food, steal, etc. Development of the dynamic nanowindows-embedded graphenes will save large amount of energy and provide safer and high efficient process. This study shows the future direction of air separation.